Nostalgic for the automotive culture of yesteryear? Then check out the world of vintage gas pumps. 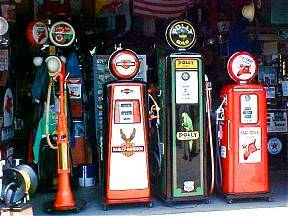 These gas pumps date back decades, and some can be found for sale originally from the 1930s. They’re a timeless bit of North American culture, relics from a not-too-distant age when automobile were a relatively young bit of widely-owned technology. And you can’t mistake the tell-tale appearance of vintage gas pumps, which look almost alien compared to their modern-day boxy-square brethren. Old gas pumps are usually instantly recognizable. This is because of their typical tall and skinny look. Normally, they’re less than half the width of modern pumps, with wild, bold colours and a large display face. Some are perched on stands, not unlike a gumball dispenser, while others are adorned with large signs on top, often circular in shape and always bearing the logo and brand name of the gas pump companies, most of which are also now historic relics. They also make great accessories (and conversation starters) for a den, rec room, a garage or even an office. But where do you find one? One good bet is online auctions and classified websites. Ebay has a section just for vintage gas pumps and all their constituent parts. For example, check out their selection of vintage gas pump globes. 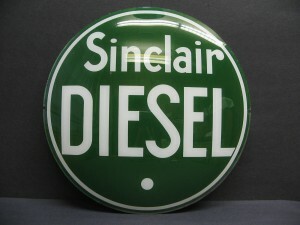 This one, a glass globe by Sinclair diesel, is put up for the seller’s hoped-for bit of $300 US. They also have a section for popular gas pumps, such as those by Texaco. Vintage pumps aren’t cheap, remember – this fully restored Texaco pump from the early 1960s goes for around $5,000 US. But the best option is checking your local online classifieds, namely Craigslist and Kijiji. These online listings can help you connect with nearby collectors offering up vintage pumps. This gives you the benefit of being able to physically check out the pump before buying, haggle on the price and bit and also means no expensive shipping costs. Plus, local antique shops will usually have a presence on these classifieds. Of these two options, Kijiji can be a better choice, since it better lets you search through its antique listings (where vintage pumps will be listed) to find the results you need. Craigslist is also a fine option (and of course the best thing to do is check both) but lacks the advantaged search features of Kijiji, though it will also point out nearby out-of-town listings, which can be helpful. How Much Is My Coca Cola Memorabilia Worth?